The bicycle's democratising role is well-documented but this chap takes it to a new level. CNN reports on Sangin Mohammed Rahmani, candidate for president of Afghanistan. 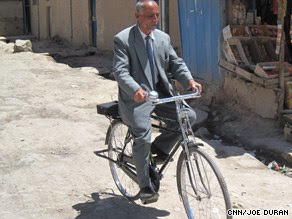 "Every morning Sangin Mohammed Rahmani says goodbye to his wife, gets on his bicycle and sets out alone on a bumpy, unpaved Kabul road that he hopes will lead him to the presidency. This is going to be my vehicle to success," he says, patting his bicycle, as he pushes it down a rutted, garbage-strewn street. "With my bicycle and my mobile phone, I can solve all the problems of the people." He's got my vote. The man on an efficient machine against The Machine. Who doesn't love an underdog? And he may stand out in his country, but in Copenhagen he'd just be a man going to work on his bike in that suit. Via: CNN. Thanks to Alyssa for the heads up.